A CAT Scan or CT is a painless procedure that uses digital x-ray images to create a 3D reconstruction of your internal organs. The modern sensitivity of a CT can detect many diseases such as infections, cysts, fractures, stones and tumors. The CT frequently uses the aide of oral contrast drinks and occasionally an intravenous contrast or “x-ray dye,” depending on what the physician needs to visualize. How a CT scan Works? 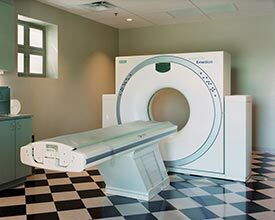 A CT scanner emits a series of narrow beams through the human body as it moves through an arc, unlike an x-ray machine which sends just one radiation beam. The final picture is far more detailed than a single x-ray image. The accuracy and speed of CT scans may be improved with the application of spiral CT. The x-ray beam takes a spiral path during the scanning, gathering continuous data with no gaps between images. Patients will need to undress, usually down to their underwear, and put on a gown. The patient will be asked to lie down on a motorized examination table, which then goes into the giant doughnut-like machine. Some patients may be given a contrast dye or substance which is either swallowed, given as an enema, or injected. This improves the picture of some blood vessels or tissues. As metal interferes with the workings of the CT scanner, patients will need to remove all jewelry and metal fastenings. In the majority of cases the patient will lie on his/her back, facing up. But sometimes it may be necessary to lie face-down or sideways. After the machine has taken one image, the table will move slightly, and then another image is taken, etc. The patient needs to lie very still for best results. During the scan everybody except for the patient will leave the room. The radiographer will still be able to communicate with the patient, and vice-versa, through an intercom. If the patient is a child, a parent or adult might be allowed to stand or sit nearby. This person will have to wear a lead-lined apron to prevent radiation exposure. Between the ages of 12 and 50 and have NOT had a hysterectomy. Less than 12 years old and are having menstrual periods. Over age 50 and having menstrual periods.